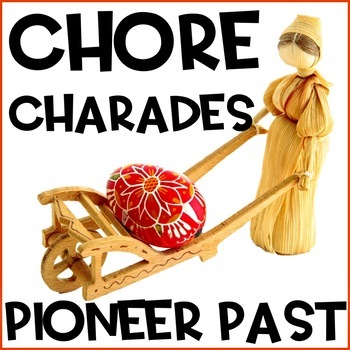 Go back in time and imagine how pioneers did chores in the past long ago with this fun game! 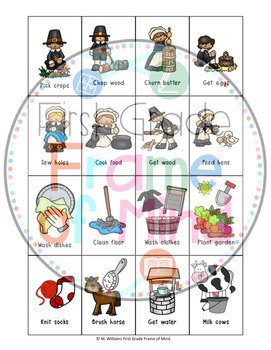 Printable cards show pictures and words of chores for groups of students to act out together in small groups while other students get to guess the chore being dramatized. There are 16 different chores to act out and an answer key included. First, discuss the types of chores so that students understand the vocabulary and how to act it out (ex. "churn" butter). Tell students how the game of charades only allows for acting and no talking or writing words. Have groups of 2-4 students, depending on the size of the class and time allowed. All students must participate, and encouraging them to be props helps those who are shy (ex. be a door, tree, chair, table, etc). Click here to follow First Grade Frame of Mind for updates and additional resources to come! Please leave any questions, if you have any, before leaving feedback. Thank you! You get one TpT Credit for every $ you spend on TpT, for both a fair rating and a fair comment on the items that you purchase. Every 100 Credits is worth $5 that you can apply towards future TpT purchases!